I’m addicted to color chip fan decks. A surprising number of people walk into the color chip part of the store and say something along this line, either under their breath or out loud, but always with feeling. 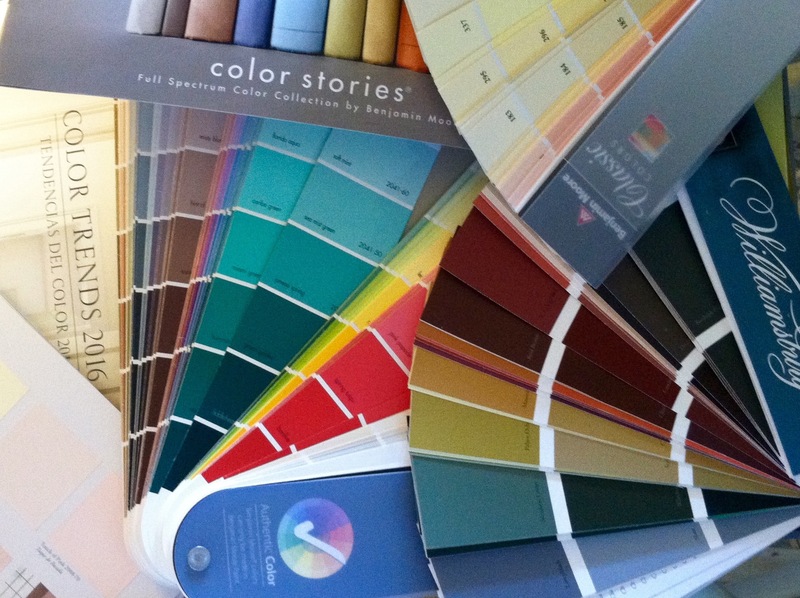 Have I mentioned yet what happens during an in-home color consultation? I bring my gardening bag full of fan decks of eight color palettes: the Benjamin Moore Classic and Preview collections, a deck of official Favorites and the 117 Whites and Off-Whites. And I bring the Affinity palette. The Affinity colors are designed so that any three colors, even randomly chosen, will look good together. I have the Historical Color (HC) deck and the Colonial Williamsburg(CW) colors. I must say the HC colors and especially the CW’s are very mature, elegant, and interesting. They seem to work very well in the houses of Southeastern Pennsylvania. And then there is the deck of the most complex colors of all, the Color Stories Palette (CSP). Most colors are made with 3 pigments. CSP colors are made using 5, 6, or 7 pigments. No Black or Gray is ever added. Even the muted and darkest shades and the browns, blacks and grays are made from red, blue, yellow, green, the ochres and the burnt siennas. These are amazing, shimmering colors and are made only in the Ben Moore AURA paint formula. I love my fan decks, but I digress. Once I find a table onto which I set my garden bag and any other workbooks I may bring in, I start asking the big, fancy color consultant questions. Why am I here? What furnishings and/or rugs are staying in the space(s)? Are you open to considering colors you may not have thought of before? The color decisions are made, the paint is purchased and rolled onto the walls and woodwork. And the transformation is a great happiness. I see that my wonderful clients all want the same thing – for their houses to be beautiful reflections of themselves and their families. They want to create rooms in which they and their friends, and extended families, will feel nurtured and comfortable, relaxed, happy and even inspired. Beauty and visual harmony such is a powerful thing. When the eye perceives color beauty, it relaxes. A happy eyeball relaxes the whole body. We all know that this is a good thing on every level for everyone. Let’s hear it for Beauty and Color Harmony! HALLOWEEN, Saturday at the Paint Shop Report…. Ceilings – what to do?